India’s prominent weekly newsmagazine ‘Outlook’ in its issue dated July 30, 2012 resorted to what one can perceptively call a cheap jibe at President Obama of the United States. It replicated the ‘Time’ July 16. 2012 Cover showing Indian Prime Minister and the label ‘The Underachiever’. 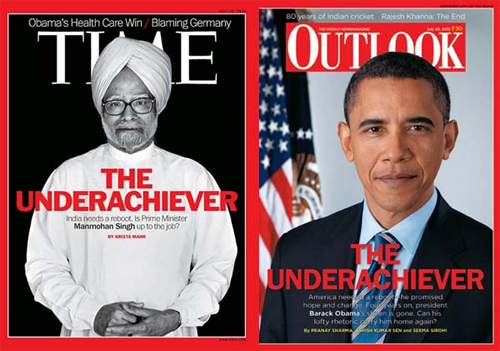 The Indian magazine issue referred carried a photograph of President Obama on the Cover similarly titled ‘The Underachiever’. By no stretch of imagination can the Indian PM be compared to President Obama in terms of decisive political and strategic leadership. Three things come to mind for this cheap jibe, namely that the Indian magazine was nudged by the Indian Establishment for a riposte, or that Outlook was toadying to the establishment on its own, or finally that misplaced nationalism got the better of objectivity of the Editor-in-Chief. Whatever be the reason the Outlook riposte left a bad taste in every right-thinking Indian especially for a magazine that claims a stature for itself in India. The riposte timing could have been staggered and the Cover should not have been an exact replica of the US Magazine and plagiarising the same title. Journalistic and intellectual bankruptcy is the reaction that immediately comes to mind. This is not the first time that Outlook has distinguished itself negatively. Soon after India’s nuclear weapons tests in 1998 its Editor-in-Chief Vinod Mehta had criticised then PM Vajpayee and argued that what was the need for nuclear weapons tests since China had not fought a war with India after 1962 and Pakistan had not attacked India after 1971. Pakistan’s attacks on Kargil and the Kargil War came soon after and China has resorted to noticeable military brinkmanship against India. Reverting to US President Obama’s stature, what stands out is that under his decisive political leadership, the United States could finally delink itself from Iraq and turned the tide in Afghanistan. On Afghanistan, India’s policy establishment is fervently hoping that the United States never makes a military exit from Afghanistan. President Obama in his personal signature style of decisive strategic leadership has asserted that the United States would partially exit from Afghanistan in 2014 and thereafter continue to be militarily embedded in Afghanistan with a sizeable military nucleus embedment even beyond 2014. Finally President Obama cannot be remotely compared with PM Manmohan Singh because unlike the Indian PM, he is not “remote controlled” by an authority outside the Government. President Obama takes independent decisions without reference to any Remote Controlling Authority. President Obama is a good friend of India and in relation to India’s military threats, namely Pakistan and China, he has done nothing to jeopardise Indian security. Rather he has upheld India’s strategic sensitivities and therefore did not deserve a cheap jibe as has been done. Personally, I like Obama. Americans showed a lot of maturity, so also the Nobel Committee in choosing Obama for Presidentship and the Nobel Prize. He may not have the charisma of Kennedy or Clinton, but he is good American leader. As regards our PM, I like him more now than when Sonia G chose him in the beginning. We Indians should retrospect. I shall make a very harsh statement for us Indians. It is time we looked at ourselves. Tell me, my fellow Indians, stnading just before our sisty-sixth independence day, tell me, how many things we Indians have invented or produced for the first time, standing well into the second decade of the twentyfirst century, that a modern man needs! Think anything from a safety-pin to an aeroplane. What a PM would do? Excepting Vivekanand, our Nobel laureates, our Yoga Gurus, a few Sitar exponents and percussionists, in modern technological society our contribution is not so significant. Every civilization has a time of impact. Indian glory time is well into the past. This is natural. Egyptian, Greek, Roman, Chinese all had had their heydays. Unfortunately, journalists may inform or conflagrate. Intelligent people will surely make their own assessments. Luckily, objectives can sometimes misfire. By doing this, Outlook has brought down its own level. TIME is no more a magazine of significance in the USA.It has a zero size and fighting to survive against the declining readership. President Obama has a much larger role in comparison to the role played by Indian PM. While Obama may or may not have done much on the domestic front, but he has tried to hold the bull by its horns. Man Mohan Singh has only added to the deglorficatin of his stature by keeping quiet and looking the other way when something needed to be done. Outlook is also an underachiever now.